SLEEPLESS is a collaboration between The Great Eastern Hotel and fourteen students from the Royal College of Arts acclaimed Design Products department. Reactive installations and objects invite guests and visitors to take part in an experience and step into a hidden dimension where a hotel is more than just a place for the night. Part of the project is Bedtime Stories whereby this blanket, designed by Tiago da Fonseca, has several sheets containing a traditional bedtime story. 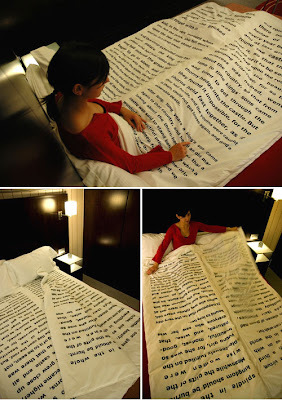 Each “page” adds a layer of linen making you warmer (or cooler) and comfier hopefully guiding you and your partner into a pleasant night’s sleep.